The ‘Nazi zombies’ trope is a rather special one to me, because it merges together three of my favourite subjects – the Second World War, the undead, and the horror genre. In a way, I’ve grown up with the trope as it appeared in various forms in the media that I consumed throughout the years. One of the first horror books that I read was a battered, dog-eared copy of The Keep by F. Paul Wilson, which features resurrected German troops as slaves, and that was followed by the Call of Duty series in the early 2000s which introduced the eponymous ‘Nazi Zombie’ mode, pitting you against unlimited waves of undead soldiers of the Reich while you had a distinctly limited supply of ammunition. And of course there were the films – the Outpost series are classics, fantastically taut and atmospheric horror films featuring endlessly resurrecting SS zombies, and of course the darkly humorous Dead Snow duology, with frozen undead Nazis chasing a group of unfortunate students through the Norwegian wilderness. There are so many more that could be named – the latest Cloverfield film, Overlord, promises to head in that direction from the look of the initial trailers – that I could spend an entire article discussing the trope. I’m not quite sure why ‘Nazi zombies’ as a theme continues to have such a grip on my imagination (and wallet), apart from the afore-mentioned blend of interests; perhaps it’s as simple as the fact that the undead being Nazis removes the qualm I might feel from killing an otherwise innocent person transformed into a zombie. Regardless of why I’m so interested, I have found that when it comes to literature, while there are many titles that feature the Third Reich’s undead, it’s a matter of quantity over quality. There are so few books that actually manage to use the trope intelligently and engagingly, and as such when such a book (or series) comes to light, I always grab on with both hands and devour it with as much enthusiasm as a Waffen-SS revenant would devour some delicious brains. This was the exact situation I found myself in, then, when last year I came across The Front: Screaming Eagles by author Timothy W. Long. The cover, and accompanying blurb, promised something that I hadn’t seen in book form before: a broad, cinematic take on the trope. You see, in all of the examples I named in the above paragraph, there’s always been a hard limit on the number of Nazi zombies, especially in the films. For whatever reason, whether the requirements of the plot or for time or budgetary reasons, you never saw more than a handful of the undead at a time, and they never seemed to have particularly ambitious goals – usually killing to remain hidden, or to retrieve some artefact that had been stolen from them. The Front, however, promised so much more than that. So much more. To hell with limitations, the blurb confidently announced – if you want Nazi zombies, then here’s a whole goddamn army of them. At the beginning of the Ardennes offensive in December 1944, a last-ditch effort by the Third Reich to cripple the Western Allies and buy time to fight the Soviets in the east, an experimental vaccine is given to the Wehrmacht forces. It’s meant to make them stronger, faster, and much more difficult to kill. It absolutely does that, as the American troops opposing them find out to their cost; unfortunately, as is always the way with these things, it also turns them into the living dead, a self-replicating army that wants nothing more than to spread and consume. Screaming Eagles was one of the best books I read in 2017, delivering a gloriously chaotic and gory take on the Nazi Zombie trope that at times seemed like an episode of Band of Brothers if George A. Romero had taken over as director. Its sequel, Red Devils, was released a few months later and was also a fantastic title. Written by renowned British horror author David Moody, one of my favourite authors, it ramped up the horror aspects of the series and provided a tense, atmospheric and brutal novel focusing on a small group of British paratroopers who infiltrated into occupied Nazi territory to try and find a cure for the virus spreading throughout Western Europe. It was a fantastic slice of horror writing, and just as importantly expanded upon the overarching plot of the series, and I eagerly awaited the next novel in the sequence. Although the overarching plot of The Front is relatively simple, it could potentially have been a little overwhelming for a new reader who hadn’t had the benefit of reading the previous titles. Fortunately, Mr DiLouie starts with an excellent prologue that provides a summary of the series so far, and then seamlessly moves into the rest of the book. Suffice to say, things are not going well at all for the Western Allies – an attempt by Patton’s Third Army to aggressively flank the undead horde ends, predictably, in mass slaughter and a retreat by the survivors to the River Meuse. It’s a great introduction that highlights the sheer amount of chaos unleashed by the vaccine, and also clearly highlights the stakes of the plot; unless the undead are stopped, and soon, their numbers and strength will mean nothing living in mainland Western Europe. Each book in The Front has delivered a different angle on the plot, with a great deal of variety in characters, and I was glad to see Mr DiLouie continue this theme. 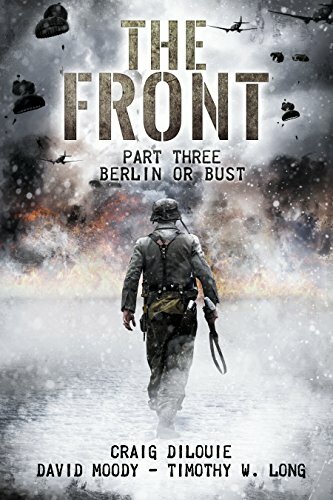 I certainly wasn’t expecting the protagonists to be Fallschirmjager, the airborne component of the Wehrmacht, but I quickly came to appreciate the different point of view these characters brought. The elite of the Wehrmacht, highly-trained and heavily armed, they’re used to achieving victory no matter the cost, with a subsequent higher level of morale. These men are tough, confident, even arrogant at times, and the author obviously did a great deal of research into them, because they come across entirely realistically. In fact, there are times where Berlin or Bust becomes an interesting analysis of the motivations of the Fallschirmjager, and DiLouie doesn’t whitewash their behaviour or motivations. They may not be fanatics of the Nazi regime – that’s made quite clear throughout the book – but they are still unashamedly nationalists and patriots who want Germany to be triumphant despite the many setbacks they’ve had since 1939. Indeed, it’s that fervent belief in Deutschland Uber Alles that eventually allows them to effectively become traitors and join the British and Americans in fighting the undead menace, it becoming very clear that the vaccine unleashed by the Nazi regime has doomed Germany right from the start. So there are some interesting ideas in Berlin or Bust, and that’s at the heart of what makes it such a good piece of military horror – it isn’t just the usual potboiler that’s as thoughtless and brain-dead as the zombies usually featured in the genre. DiLouie deftly examines the motivations of various characters in the book, and how they react (in violently different ways) to the world suddenly and violently changing. The well thought-out narrative, and the food characterisation, is allied with some fantastically fast-paced and often brutal action scenes, starting with a rather surprising skirmish between the airborne troops and elements of the Waffen-SS. It turns out that while some in Germany have realised cooperation must come before ideological purity, the SS have remained loyal to Hitler and attempt to stop the paratroopers from leaving Germany. From there it’s a tense flight to Britain, and then an urgent, chaotic period of training before dropping on Berlin in a desperate attempt to find the source of the undead plague and locate a way of ending it once and for all. The author really nails the tense, frenzied and fundamentally untrustworthy atmosphere that would dominate such a situation, trying to get former foes working together to fight a menace that could quite literally end all life on the planet. DiLouie readily plays up the fundamental differences between the Allied and Axis forces, and pleasingly doesn’t go the route of making them all find some common ground; all are aware that this is a temporary cessation of hostilities in the face of a greater evil. When the Fallschirmjager finally do drop on Berlin, DiLouie really ramps up the tension, throwing in action scene after action scene, and hordes of the undead, all liberally smeared with buckets of gore and featuring some rather unsettling descriptions of the undead citizens and (former) defenders of Berlin. As the paratroopers fight desperately towards their goal, DiLouie all too realistically evokes the confusion and destruction of a hasty, opposed airborne landing, especially once it becomes clear that the undead have now penetrated into Soviet territory as well. There are some great twists and turns, including a fantastically bizarre cameo by a certain Nazi leader, and there were times when I genuinely didn’t know where the story was leading until the last few pages. Berlin or Bust is another brilliant entry in The Front series, and does Mr DiLouie great credit as a horror author. Well thought-out characterisations, even and compelling pacing that ramps up to a brutal close-quarters rampage through undead Berlin in the last third of the book, and consistently vicious and often horrifying action scenes, all combine to create a blood-spattered, memorable and above-all deeply enjoyable title that serves as a rare example of how to do military horror right. I can only hope that the next entry in the series comes as soon as possible! I have a strange genre question: Do you think this and other “supernatural WW2 [or WW3 from our review :p ]” stories deserve to be considered “Alternate History” alongside the likes of Turtledove and Sea Lion Press?